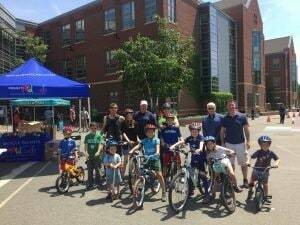 In the Community: Our attorneys with members of the Somerville Kiwanis Club and Somerville Police Department at Bike Safety Day 2016. Read about our 2016 bicycle helmet donations to children in Somerville. The attorneys of Breakstone, White & Gluck represent cyclists and others who have been injured by negligent or reckless drivers. We represent residents of Somerville and are committed to giving back to the community each year. Through our Project KidSafe campaign, we have donated children's bicycle helmets to the Somerville Kiwanis Club, Groundwork Somerville and SHIFT Community Bicycle Collective. We also partner with CYCLE Kids each year, donating a new helmet to every 5th grader in Somerville Public Schools. Our goal is to prevent head injuries and encourage children to wear helmets every time they ride. We hope you are never injured, but if you are, learn your rights before taking any action. Our attorneys offer a free legal consultation. Call 800-379-1244 or 617-723-7676 or use our contact form. "We know the stakes are high. We know our clients depend on the results of our efforts. It’s what drives us to work as hard and to be as thorough and tenacious as we are." From Davis Square to Assembly Square, Somerville is known for cycling. Just north of Boston, the city has over 81,000 residents and covers about four-square miles, making it one of New England's most densely populated communities. Many cyclists are commuters, traveling to Cambridge and Boston for work or college. In 2014, the League of American Bicyclists reported 8 percent of Somerville residents bike to work and that Somerville had the highest percentage of bike commuters in the Northeast (with Cambridge close behind). In 2016, the City of Somerville reported an even higher figure of bicycle commuters - 12.5 percent. So it comes as no surprise that Somerville cyclists turn out strong each year for the MassCommute Bicycle Challenge. In 2017, the city's cyclists logged the most miles of all communities. The Somerville Bicycle Committee regularly conducts cyclist counts and reports on Somerville cycling accidents. In 2017, the committee reported nearly 25 percent of Somerville cycling accidents happened on Beacon Street or Somerville Avenue. Beacon Street is one of the most heavily traveled roads in the Boston area, with 450 cyclists per hour at peak commuting times. More than 50 percent of bike crashes happen between 7-10 a.m. and 5-8 p.m. The Massachusetts Department of Transportation (MassDOT) regularly reports on the state’s top crash locations involving bicyclists, pedestrians and motor vehicles. Cambridge has 8 of the top 10 bike crash areas, in the most recent reporting for 2005-2014. Somerville was included in 4 areas. 2002-2010: Inman Square in Somerville and Cambridge was the top area in all of Massachusetts for bike crashes. 2005-2014: Somerville was included in four of the top 10 areas for bike crashes in Massachusetts. Union Square, along Washington Street and Somerville Avenue, was the only cluster to fall entirely in Somerville. Three other clusters were in both Somerville and Cambridge, including Inman Square along the intersection of Cambridge Street and Hampshire Street; Porter Square including Massachusetts Avenue, from Rindge Avenue to Everett Street; and Cambridge Street, from Berkshire Avenue and Cardinal Medeiros Avenue to Sixth Avenue and Thorndike Street. Another highly traveled area is along the Medford border, where Tufts University has offices in both Medford and Somerville. Somerville has miles of bike lanes along with an off-road option, the Somerville Community Path, and continues to make improvements. The city and MassHighway have been working away on reconstruction of Beacon Street to create resurface the road, add protected bike lanes, pedestrian crosswalks and traffic signal improvements from Oxford Street to the Cambridge city line. Meanwhile, the city of Cambridge has introduced separated bike lanes near the Somerville border, along both sides of the street from Inman Square to Sanders Theater, approaching the Harvard Square area. This move was made after the tragic death of cyclist Amanda Phillips in June 2016. The young woman collided with a Jeep door which was left open near the intersection of Hampshire and Cambridge streets. She was then struck and killed by a landscaping truck. The state of Massachusetts made its own change aimed at reducing dooring accidents in 2017, adding a page about the Dutch Reach method to the Massachusetts Driver’s Manual. We hope the move raises attention because dooring has been against the law in Massachusetts since 2009, under M.G.L. c.90 § 14. Drivers should be watching for cyclists and pedestrians, even after they park. The League of American Bicyclists has recognized Somerville as a Bicycle Friendly Community, with a silver award ranking. The advocacy group noted Somerville's progressive infrastructure, design and policy work in recent years. Massachusetts Bicycle Laws. If you have a cycling question, we may have the answer in our Quick Facts About Cycling In Massachusetts guide. Somerville Bicycle Regulations. 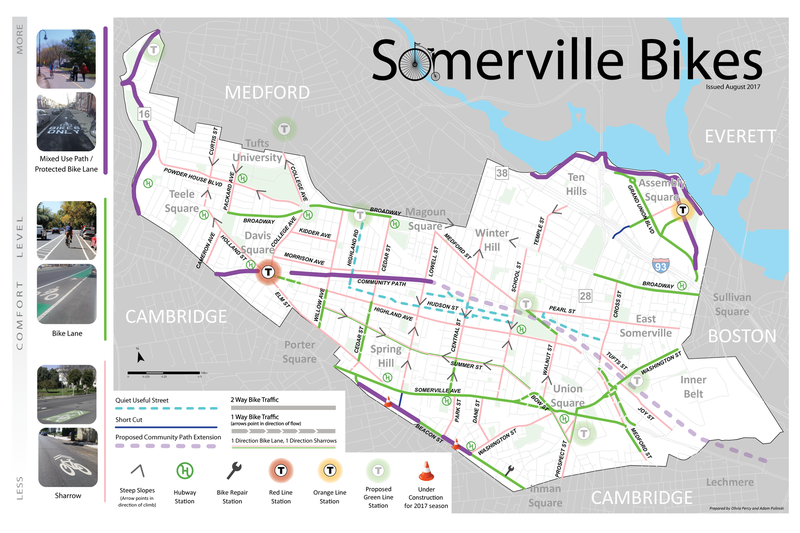 The Somerville Bicycle Committee maintains maps about construction and road conditions and sends regular e-mail updates for cyclists. The Somerville Police Department asks bicyclists who live in Somerville to register their bikes with the department in case of theft or accident. While it is permitted to ride on sidewalks in some areas, the Somerville Bicycle Committee recommends on-street riding. Breakstone, White & Gluck donates children's bicycle helmets in Somerville each year through our Project KidSafe campaign. Cyclists who are 16 years of age or younger must wear helmets while riding bicycles, under M.G.L. c. 85, § 11B. But we encourage cyclists of all ages to wear a helmet every time you ride and to also wear a reflective neon vest so you stand out to drivers. Wearing a properly fitted bicycle helmet can help prevent a serious and life-changing head injury if you are hit or fall on your bicycle. What Should You Do If You Have Been Injured on a Bicycle? If you have been injured in a Somerville bike accident, seek immediate medical attention from a doctor or emergency room. If you suffered any injuries or have to miss work, contact an experienced bike accident lawyer to protect your rights. When a motorist collides with a cyclist, Massachusetts law provides that there will be up to $8,000 in personal injury protection benefits (“no-fault” benefits) which can help pay for medical bills and lost wages. These benefits are available even if the driver was not negligent. When this is exhausted, an attorney can help you identify additional insurance to cover your medical bills, lost wages and pain and suffering. The lawyers of Breakstone, White & Gluck have over 100 years combined experience representing injured cyclists in Somerville, Everett, Medford and across Massachusetts. We hope the resources on this page help you ride safely. If you are ever injured, it is important to learn your rights and act promptly. Massachusetts has a Statute of Limitations - or a deadline - for filing injury claims. Feel free to contact us for a free legal consultation at 800-379-1244 or 617-723-7676 or use our contact form.